With a stay at Governor West Bay Suites & Residences in Doha (Diplomatic Area), you'll be minutes from City Centre Shopping Mall and close to Museum of Islamic Art. 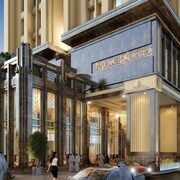 This 5-star aparthotel is within close proximity of Doha Exhibition and Convention Center and The Gate Mall. Make yourself at home in one of the 190 air-conditioned rooms featuring kitchens with full-sized refrigerators/freezers and stovetops. 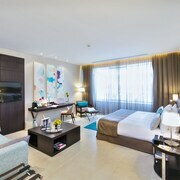 Your bed comes with Egyptian cotton sheets, and all rooms are furnished with sofa beds. 42-inch LCD televisions with satellite programming provide entertainment, while complimentary wireless Internet access keeps you connected. Detached private bathrooms with separate bathtubs and showers feature deep soaking bathtubs and complimentary toiletries. Relax at the full-service spa, where you can enjoy massages, body treatments, and facials. You can take advantage of recreational amenities such as a 24-hour health club and an indoor pool. Additional amenities at this aparthotel include complimentary wireless Internet access, concierge services, and babysitting/childcare (surcharge). Enjoy a meal at one of the aparthotel's dining establishments, which include 3 restaurants and a coffee shop/cafÃ©. From your room, you can also access 24-hour room service. Relax with a refreshing drink at one of the 4 bars/lounges. Buffet breakfasts are available daily for a fee. Featured amenities include a business center, limo/town car service, and express check-in. Planning an event in Doha? This aparthotel has 3497 square feet (325 square meters) of space consisting of a conference center and a meeting room. Guests may use a roundtrip airport shuttle for a surcharge, and free valet parking is available onsite.